We're proud to announce that Android 9 Pie is now available on Essential Phone! Your experience with Essential Phone is important to us. And that’s why our team worked so hard to make sure you got the latest version of Android on launch day. What's one feature in Android Pie you've enjoyed using most? Jean-Baptiste: The support for "Secure Element" for making secure payments. Previously, each manufacturer had to use a third-party service, which comes with a lot of potential issues during development. Having a standard implementation—and standard certification testing as a part of Google CTS (Compatibility Test Suite)—is a huge win for users! They can expect better and easier support for payments with Android in the future. Elyse: The ability to turn down (but not off) the touch vibrations. I have them set to low now, and it's nice to get vibrating feedback when using my phone. But now, it's much subtler than before! I also like the new volume control. I used to get so confused and frustrated when trying to change the volume for one app (example: ring volume) and the phone thinks I'm trying to change the volume for another app (example: media volume). Now I know that the default is for Media volume, and one more tap reveals volume settings for everything else. But I'm probably most excited about the Adaptive Battery manager. I can prioritize power to apps and services to improve overall power. I'm ecstatic! Why is it so important to get updates out to Essential Phone users as quickly as we do? Elyse: We want to keep our community engaged and happy. I think we're lucky to have a very devoted group of users who provide us a lot of feedback during (and after) our Beta periods—so it's nice to be able to respond to that feedback as soon as possible. Every time we send out software patches and security updates, we're responding to our vocal user base and doing our best to deliver what they want. Ron: Consumers have learned from experience that the phones you buy from well-known brands rarely push software updates in a timely manner, if at all. That means all those bug fixes or improvements that would make your experience so much better often don’t make it to your phone. Essential is showing that if you're scrappy and motivated, you can get the latest dessert release on the same day Google releases it to the public. As an avid Android user, I want the latest and greatest that Android has to offer. I love that we're doing something very few companies are willing to do. Jacin: Because it’s the right thing to do for our customers. Our customer base is extremely important to us. And to show that companies—no matter how big or small—can keep your phone updated if they make it a priority. Rebecca: We think users are hungry for the latest and greatest features, and staying up to date on security patches is good for everyone. From the very beginning, the whole team was on-board with getting updates out as aggressively as possible. What would you like our community to know about what it takes to make that happen? Jean-Baptiste: A lot of work ahead of time! We committed ourselves to offer the latest software available, and to provide our OTAs with the latest Linux kernel available. All of those things require a lot of planning and dedication to make it happen. But this is what Essential is about: A small team dedicated to providing the best software available to our users. Elyse: Our small teams contribute big time to getting updates out at lightning speed. We have a very dedicated group of engineers and testers and a tight process. There isn't a lot of back and forth between multiple teams to bring this all together. Our project managers, and software and quality engineers work together very closely. We're able to communicate with each other at all hours of the day to make sure that issues get resolved ASAP. And we have incredibly quick turnaround with building and testing our patches as a result—no red tape to worry about here. Ron: I feel like it's a 4x100 relay. Once Google handed off their latest P beta release to us, we sprinted to merge this code into ours and handed it off to QA/Beta testers to ensure the build is consumer-ready. There's a sense of accomplishment knowing we're crossing the finish line and giving our customers the P release at the same time Google is releasing to the public. Jacin: We plan our releases two to three months in advance. And we have a very dedicated Development / Quality Assurance process that takes a lot of pride in making sure we get the releases out on time. Sometimes that means putting in extra time on nights and weekends with the specialized testing that is needed to meet release criteria with Google. Rebecca: It takes an amazing team that's 100% committed to doing right by our users—along with a lot of planning, the occasional late night and the help and support of great partners like Google. What’s been the most challenging hurdle to overcome in getting Android Pie ready for launch day? Elyse: One of the trickiest bugs we had to resolve was an issue where jumping from Nougat directly to P (skipping Oreo altogether) broke Wi-Fi. The system couldn't gracefully handle jumping an entire Android version. It took several attempted fixes and plenty of late night testing before we got it figured out. But we did! What surprised you most about building Android Pie for Essential Phone? Jean-Baptiste: Google made a significant effort in Oreo, and finished it in P, to separate Google code from Vendor code (Treble). This is an amazing change for OEM's, because it offered us more flexibility, and allowed us to release updates to our users much more quickly. Ron: Gestures and Navigation was the biggest surprise to me. It's taken some time to get used to, but it's growing on me! Jacin: Very pleased with how quickly we were able to get Android Pie on our hardware thanks to Treble. Even without full vendor support at the time, we had working builds of Pie. Rebecca: We've gotten to see the payoff of the work we did for project Treble on Oreo. Overall, our P migration has been really smooth. 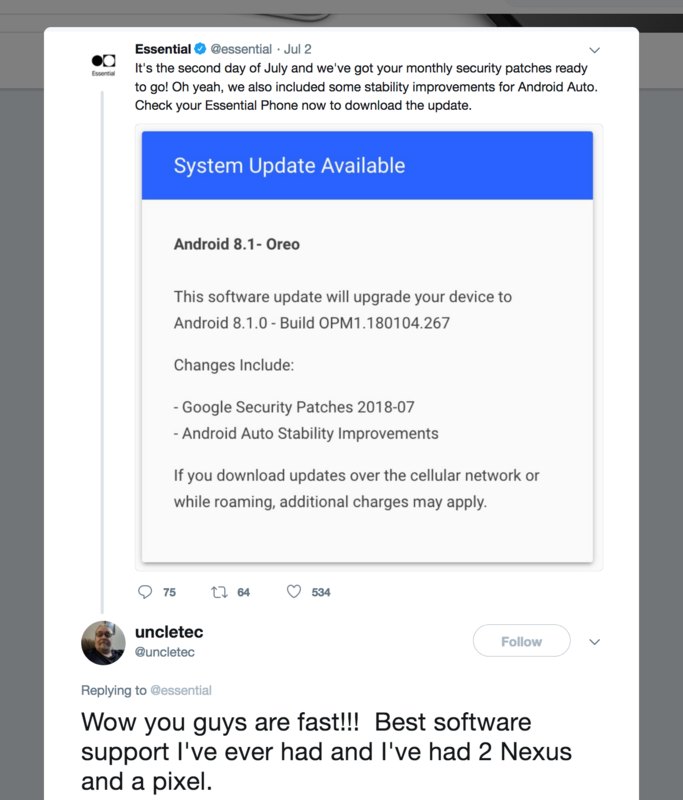 Why would you recommend people upgrade to Android Pie from Android Oreo? Elyse: The build will have the latest and greatest changes from Android. The UI is a bit sleeker, and the new swipe gestures on the home key make it a lot easier to switch among your recent apps. Jacin: The new gestures are pretty slick! And Adaptive brightness is also very quick. Rebecca: Android gets better and better in every release. P has a bunch of new settings, new look and feel, and a new gesture UI. What do you think Android Q will be named? Jacin: Since we just learned Android 9.0 was called Pie on launch day, it’s hard to know. But I’ll guess Android Quiche!